Extractables and leachables from disposable manufacturing systems must be addressed as part of process validation. Extractables are compounds that can migrate from a material into a solvent under exaggerated conditions of time and temperature. Leachables are compounds that actually do migrate into a drug product formulation under normal processing conditions. All materials have extractables and potentially have leachables. When properly evaluated, both are easily addressed and rarely lead to disqualification of a disposable component. No specific standards or guidances reference extractables and leachables from single-use, disposable bioprocessing materials. But there are regulatory guidances and industry–regulatory collaborations that address them for final containers and closures and for orally inhaled nasal drug products (OINDP). This conclusion of a two-part article takes the existing body of knowledge and guidances and applies them (where appropriate) to disposable bioprocessing materials. Before extractables and leachables evaluation, a process should be reviewed and documented and a comprehensive list made of the processing materials it uses. In addition, key operating information such as formulation composition, processing volumes, and contact times and temperatures should be documented. Other applicable information (e.g., pH, product stability, and viscosity) may also affect the extracting capabilities of a formulation. Figure 1 shows BPSA’s recommended program for addressing leachables and extractables. The first two steps were covered in Part 1 and are reviewed in brief here. Product Contact: All materials with product contact need to be addressed for extractables and leachables. In review of a materials list for a biopharmaceutical process, it may become apparent that some materials do not have intimate contact with the product. With such materials, extractables and leachables are less likely to be a problem, so they may not need to be addressed. 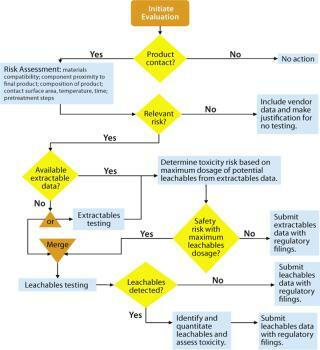 Risk Assessment: The second part of an extractables–leachables program is assessing the risk of safety or regulatory concerns based on key risk factors: material compatibility, proximity of a component to the final product, composition of that product, component surface area, contact time and temperature, and related pretreatment steps. When a risk assessment is complete, there may be materials that pose no relevant safety or regulatory risk. In such cases, no further action may be required as long as that can be justified. More likely, some further consideration is appropriate. Vendor-Provided Extractables Data: If further investigation of extractables and leachables is warranted, a user should obtain an extractables profile, either from the vendor or another source. Ideally, this profile should be produced using appropriate methods so that most potential leachables are identified. Comprehensive extractable data for components can reduce the time and resources needed to qualify leachables from the systems where they are used. When comparing supplied extractables data for components constructed of like materials, end users should carefully review the methods used to generate the data. Less rigorous methods may under-represent the actual levels and extent of extractables, and a report describing more extractables may simply come from using more rigorous methods. The component used for an extractables study should be the same one that will be used in a process, and it should have the same pretreatment steps as is intended for that process. For instance, if a process uses gamma irradiation for sterilization, then the component used for extractable testing should be sterilized by that method. It is impractical for a vendor to supply extraction data that brackets all specific process formulations or operating conditions. There will be applications in which end users must obtain a unique extractables profile. Such profiles are ideally generated with the following basic components: extractions using at least two solvents, analysis by high-performance liquid chromatography (HPLC) and gas chromatography with a mass spectrometer detector (GC–MS), additional quantitative investigations, and identification and quantitation of extractables. Extraction with At Least Two Solvents: The solvents used should include water and a low–molecular-weight alcohol such as ethanol or n-propanol. Where appropriate, an organic solvent with the appropriate solubility parameters will help identify additional extractables. Extractions should be performed at relatively extreme time and temperature conditions. However, the solvents or extraction conditions should not be so extreme as to degrade materials to a point at which they are not mechanically functional (e.g., melting or dissolving). Extreme conditions used should be relative to those under which a material is normally used. For example, one normally used at room temperature might be extracted at an elevated temperature of 50 °C or 70 °C. Analytical Methods Should Include HPLC and GC-MS: Methods of analysis used for extractables analysis should detect and identify specific, individual, extractable compounds. HPLC with an ultraviolet (HPLC-UV) or mass spectrometer (LC-MS) detector and GC-MS are the most scientifically robust methods for this purpose. When metals are a concern, inductively coupled plasma analysis is widely used, both with and without mass-spectrometric detection (ICP and ICP-MS). 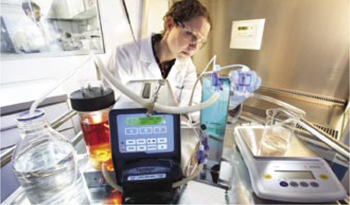 Additional Quantitative Investigations: Methods such as total organic carbon (TOC), ash, and nonvolatile residue (NVR) analysis can be used individually or collectively to estimate amounts of extractable material present and to ensure that targeted methods are not missing a major extractable constituent. For instance, nonpolar compounds without chromophores can be identified using Fourier-transform infrared (FTIR) analysis of nonvolatile residues. titation of identified extractables is informative, but it does not need to be performed at a high level of precision. This is different from recommendations for evaluating extractables for final containers, closures, and OINDPs, for which analytical and toxicological limits should be set based on a measured level of extractables (1). The Bio-Process Systems Alliance (BPSA) gives visibility and a united voice in promoting benefits of single-use manufacturing to vendors of this technology. A key focus of BPSA’s core activities is to educate and to develop guides that safeguard the quality of drugs produced using single-use technology. As one of its initiatives, the BPSA Extractables and Leachables Subcommittee is developing a series of documents to serves as a starting point for addressing leachables and extractables with single-use systems. The first of this article’s two parts contained information regarding the key definitions and regulatory requirements, and it described a risk-assessment approach with which to initiate an extractables and leachables program. This conclusion describes a complete program and details extractable testing methods. If high-quality extractable data are available, a toxicity assessment can be made for leachables based on the extractable profile. This would be considered a worst-case scenario because the concentration and number of extractables are expected to be higher than what will be measured during leachables testing. Being specific to each application, toxicity assessments are the responsibility of end users. Unlike in such assessments for final container–closures, single-use systems often include a significant dilution of leachables before dosage. For instance, a 10-L bag may be used for 10,000 doses, in which case the mass of leachables as estimated by the mass of extractables would be divided accordingly for a toxicity assessment. It is therefore possible that risk assessment combined with evaluation of an extractable profile will lead to a conclusion that no further action is required. But it is more likely that additional evaluation will be warranted. If Extractable Data Are Insufficient or Unavailable: Extractable data will not always be available for the wide variety of materials that contact a biopharmaceutical process stream. Sometimes, available data may not appropriately bracket a specific end-user application. And single-use systems are often customized (e.g., a bag from Vendor A is packaged with a filter from Vendor B, tubing from Vendor C, and connectors from Vendor D). It is not reasonable to expect that such systems constructed using every combination of vendors have been tested for extractables. If data are available for each component, then they can be evaluated individually. If extractable data are unavailable for one or more components, an end user may choose to perform extractable studies on the assembled combination to obtain specific results for that custom-configured system. However, significant resources are needed to detect, identify, and quantitate extractables. To obtain such data may be worthwhile for end users who plan to use such customized assemblies in many applications. However, it may not be realistic without such economies of scale. In that case, one alternative for end users is to proceed directly to leachables testing. This would not be considered an appropriate route for final container–closures, for which assessments of both extractables and leachables are generally expected by regulatory agencies. However, for disposable bioprocessing components, leachables testing without prior extractable testing may be sufficient for regulatory submissions. Bypassing the compilation of extractables data is more likely to be acceptable in lower-risk situations (such as the use of processing buffers) and less likely to be acceptable in higher-risk applications (such as formulations containing significant organic content). Leachables are determined based on extractions that closely model actual processing conditions. For example, an extraction is performed using normal processing temperature instead of extreme temperatures. Instead of extracting with a low–molecular-weight alcohol or hydrocarbon, the actual formulation or a suitable model is used. Because leachables testing uses less-extreme conditions than extractables testing does, leachables detected are usually fewer in number and lower in concentration than extractables would be. If leachables are detected, they should be identified, quantitated, and assessed for toxicity. Often, process conditions are mild enough that no leachables are detected by sensitive analytical methodologies, and such results can be submitted to support a “no leachables” conclusion. Extractables and leachables are part of a validation program for single-use biopharmaceutical systems. All materials have extractables and potentially have leachables. Minimal regulatory guidance directly addresses these for biopharmaceutical manufacturing systems. Therefore, regulatory and safety risks are minimized by addressing extractables and leachables early in a validation program. The degree of testing and analysis is determined by the relative risk that leachables from a single-use processing material poses to a final drug product. In low-risk applications, minimal evaluations may be appropriate. In higher-risk cases, the degree of testing will approach that required for final container–closures. Suppliers of single-use bioprocess systems are a good initial source for obtaining information on extractables. However, it is always the responsibility of a product sponsor to ensure that leachables are appropriately addressed. Here are answers to some frequently asked questions about leachables and extractables assessment. Which component materials should be evaluated for extractables? Those component materials should be evaluated that have the potential to come into direct contact with a manufactured drug product during its production process. Also evaluate those materials that have the potential to come into direct contact with patients. Should I be concerned if many extractables are detected using aggressive extraction conditions? Because controlled extraction studies are designed to generate extractables, the presence of extractables is expected. This does not necessarily reflect the degree and concentration of leachable compound(s) that will be found upon contact with a product stream. Detection of a toxic or otherwise undesirable extractable under aggressive conditions requires testing to ensure that migration to product is below acceptable limits under actual processing conditions. What are the methods for preparing plastic and elastomer products to look for extractables? Controlled extraction studies need to use vigorous extraction techniques with multiple solvents of varying polarity to fully elucidate the extractable analytes in question. Techniques such as Soxhlet extraction, solvent refluxing, microwave extraction, sonication, and/or acid washing at elevated temperature may be used. When I conduct a controlled extractable study, do I extract components whole? It is most common and generally acceptable for processing materials to extract components whole. For extractables testing, you may choose to maximize the contact surface area by mechanical methods such as cutting or grinding. For leachables testing, it is most applicable to mimic actual process conditions by leaving test components intact. How can I find information on the toxicity of extractables found with my components? Evaluation of toxicology should be performed by a qualified toxicologist based on the dosage and route of administration. The BPSA has no specific recommendations regarding the toxicology of specific extractables or leachables. A PQRI document on extractables and leachables in OINDPs suggests an approach to address toxicology using LD50 with a 1,000× or 10,000× safety factor based on the dosage quantity (1). In addition, several structural activity relationship (SAR) databases are readily available to professional toxicologists. Examples include the “Carcinogenic Potency Database” (CPDB) (2) and the US Environmental Protection Agency’s “Distributed Structure-Searchable Toxicity Network” (DSSTOX) database (3). The PQRI document suggests a study design for addressing toxicity. Fourier-Transform Infrared Spectroscopy (FTIR): An analytical technique in which samples are subjected to infrared radiation. Infrared spectroscopy can supply functional-group information and is useful for identification of unknowns. This technique is most valuable for relatively pure compounds. Gas Chromatography (GC): An analytical separation technique in which samples are vaporized into an inert carrier gas and passed through a capillary column containing a stationary phase. The column separates individual components of the sample based on intrinsic chemical properties such as molecular weight, polarity, and vapor pressure. GC can detect most compounds as long as they are volatile or semivolatile. High-Performance Liquid Chromatography (HPLC): An analytical separation technique in which samples are injected into a polar or nonpolar aqueous or organic solvent mobile phase and carried through a column containing a stationary phase. The column separates components of the sample based on chemical properties such as molecular weight, polarity, and electrical charge. Those components are detected by one or more methods such as UV-vis (ultraviolet–visible light), mass spectrometry (MS), refractive index, and fluorescence. HPLC can separate compounds regardless of their volatility. A limitation is that no single detector can detect all molecules. Inductively Coupled Plasma (ICP) and ICP-MS: Analytical techniques by which a sample is nebulized into a gaseous plasma with its molecules decomposed into atoms. The excited state of each atom emits a particular wavelength of light that can be detected either optically or by MS. Although ICP is amenable to all analytes, it is most commonly used to identify and quantitate metals. Mass Spectrometry (MS): Detection method that breaks a target compound into ion fragments by applying an electric charge. Those ions are then separated based on their mass and charge. MS can be used as a detector for HPLC (LC-MS) or GC (GC-MS), and an analysis of fragment patterns can help to identify compounds. Nonvolatile Residue (NVR) Analysis: A method to estimate total extractables in which an extraction media is evaporated to dryness, and the residue is weighed and compared with that of a negative control (solvent that does not contact a test article). NVR measures nonvolatile extractables and many semivolatile extractables. It will not capture volatile and certain semivolatile extractables, depending on the relative vapor pressure difference of the extractables and extraction media. This technique is used with extraction media that do not contain significant nonvolatile compounds. Product Contact: Contact of a solid with a liquid or semisolid processing medium or dosage form in which such contact could result in migration of leachables that may be included in a final product. Total Organic Carbon (TOC) Analysis: A method to estimate total extractables in which the organic carbon in extraction media is oxidized to form carbon dioxide, which is then measured using an IR detector. TOC can provide an accurate measurement of organic extractables when used with test media that do not contain significant amounts of carbon. What are some classes of compounds the industry is highly concerned about as extractables? Various compounds can be of concern. Those that have been particularly identified include n-nitrosamines, polynuclear aromatics (sometime termed polyaromatic hydrocarbons, PAH), and 2-mercaptobenzothiozole, along with biologically active compounds such as bisphenol-A (BPA). Do I need to validate my methodology for testing extractable analytes? For determination of leachables in products, it is currently industry standard to validate analytical methods according to ICH and USP criteria. This ensures appropriate levels of analytical precision and accuracy. What substances, at what levels, can be extracted from a product? Various chemicals are added to plastic and elastomer formulations and can be extractables. They are typically proprietary to each manufacturer. These chemicals may be used as lubricants, plasticizers, antioxidants, stabilizers, antistatic agents, impact modifiers, catalysts, release agents, colorants, brighteners, bactericides, and blowing agents. Individual extractable compounds are too numerous to list, but examples include aromatic antioxidants such as butylated hydroxytoluene (BHT), oleamide, bromide, fluoride, chloride, oleic acid, erucamide, eicosane, and stearic acid. The concentration of organic extractables in a drug product formulation depends on the composition of that formulation. Organic extractables will leach into formulations at a higher level if they have significant organic content or if compounds such as surfactants are present. The mass of an extractable that leaches is divided between all the doses in a production batch and thus is often significantly diluted from the worst-case extractable or leachable test results. What is the time frame for developing extractables data using sponsor-requested liquids and test conditions? There are far too many manufacturing systems and formulations to suggest a specific timeline. Generally a product sponsor should anticipate four to six months to complete a controlled extraction study. The information and examples provided in this document are not necessarily exhaustive or exclusive and do not claim to satisfy all current regulatory or other legal requirements. This information is offered in good faith and believed to be technically sound when provided, but is made without warranty, expressed or implied, as to merchantability, fitness for a particular purpose, accuracy, reliability, or any other matter. In publishing and making this document available, SPI, its members and contributors do not assume any responsibility for the user’s compliance with applicable laws and regulations, nor do they undertake any professional or other obligation to any persons relying on these materials for such compliance. SPI disclaims liability for any personal injury, property, or other damages of any nature whatsoever, whether special, indirect, consequential, or compensatory, directly or indirectly resulting from the publication, use, or application of, or reliance on, this document. SPI is not a testing body and does not undertake to guarantee the performance of any individual manufacturer’s or seller’s products, designs, installations or services by virtue of issuing this document. Manufacturers, processors, distributors, and other users of this document should consult with their own legal and technical advisors in complying with applicable laws and regulations. ced with precise detection systems. Examples of such analytical tools include HPLC equipped with diode-array detection, MS detection, or conductivity detection; GC equipped with MS detection or thermo energy analysis; and ICP or ICP-MS.
How are nonspecific analytes quantitated? The overall quantity of extractables or leachables can be estimated using nonspecific methods such as TOC and NVR analysis. Such nonspecific quantitation is especially useful in comparing materials before their final selection for a process. Does the level of extractable analyte(s) need to be quantitated? If you’re going to use extractables data to qualify a material in a process, then you should determine the identification and concentration of the extractables. If you’re going to perform leachables studies in addition to obtaining extractable data, then it is not as important to quantitate the extractables. It is then important to quantitate identified leachables. What kind of standard documentation should a vendor supply? It should be the goal of every vendor to understand the product it is providing to customers. However, every sponsor’s needs are different. It is the goal of this BPSA working group to provide guidance to product vendors on what and how much information should generally be available. Such guidance will be the focus of future BPSA committee papers. How do extractables and leachables relate to shelf life or service life of components? It is well understood that plastic and/or elastomer materials have a limited shelf and service life. Addition of chemicals to plastic and elastomer formulations very often increase product shelf life and service life. 1.) PQRI Leachables and Extractables Working Group 2006. Safety Thresholds and Best Practices for Extractables and Leachables in Orally Inhaled and Nasal Drug Products, Product Quality Research Institute, Arlington. 2.) Gold, LS. 2007. Carcinogenic Potency Database (CPDB), University of California, Berkeley. 3.) EPA Computational Toxicology Program 2007. Distributed Structure-Searchable Toxicity (DSSTox) Database Network, US Environmental Protection Agency, Washington.